This resource features the general description of an adventure location for RPG adventures or general inspiration. Not all releases are the same; some may include rules material for Dungeons and Dragons 5e but mechanics are left to a minimum. These adventure ideas are appropriate for high-level (Levels 10+) adventur­ing parties. As the DM, you are free to change or modify any or all the information found here. NPC names and settlement names are the first you should consider changing to accommodate any homebrew-world lore. When monsters are referenced, the creature’s name is noted in bold. Only creatures from the D&D5e Monster Manual are cited. After centuries and generations, the realms of men have faced many dangers and surpassed insurmountable tests. But nothing comes close to the veiled threat of a vicious cult to an obscure entity known by many names. The cultists themselves ignore the full implications of their actions, only the highest ranking priests understand a part of the truth. The being they worship is known as the Black Star, but that is only a naming convention within their own organization. The true identity of their otherworldly benefactor is more sinister. The cult dedicates their prayers and obscene sacrifices to a creature known as the Atropus. This creature is covered by a cloak of myths, legends, false truths, and incorrect interpretations. It does not help that it is known by scores of names and it inhabits a faraway world not accessible even through magic. What little is known of the Atropus is kept secret by a few disturbed minds which struggle every single day to sleep soundly with the terrible truths in their heads. Only a handful of scholars and wizards know the story; even fewer books exist with this information recorded. At the beginning of time, when primordial spirits and gods waged wars among themselves for noble or useless purposes, a goddess gave birth to a stillborn child. Drowned in sorrow, the goddess did not have the heart to destroy or bury the body. Instead, she let the body of her unborn son drift across the Astral Sea in a never-ending pilgrimage. This practice was not rare in the few occasions when a divine creature lost their life, but it is the only time it was done with a fetus. The Astral Sea is so unimaginably vast that the odds of finding anything floating in it are predictably zero. It is not known how or in which circumstances, but the dead stillborn body was found eons later. The primordial war was over and only the gods remained with their petty squabbles. An evil deity found the dead fetus. The corpse was as large as a room, despite its death during childbirth. The evil deity knew that the child had a divine spark within. Such is the nature of gods; though it is difficult to kill one, it has been done. But the divine spark shall never extinguish. Through a delicate process of necromancy and a ritual which lasted a thousand years, the evil god revived the stillborn son. It was not a pleasant coming back to life. The creature was malformed, ill-fitted for life, and infused with evil necromantic energy. It was crippled and could not do much except wiggle around, yet it was full of rage. The resuscitated stillborn god is the Atropus. Limited to its useless form, the Atropus developed strong magical and mental abilities. In the Astral Sea, it could change the shape of the world around him. And everywhere it went, it left nothing but death behind. One day the Atropus came across a small planet (demiplane). It let its body plummet down into the planet. The impact was such that it killed all life forms on it. Then the Atropus mutated, it grew tendrils and tentacles which encompassed the total mass of the small planet. It left behind its failed form and became an ascendant entity in the form of a planet. The small plane is bound to an orbit which will never bring the Atropal close to anything, but the cults in the material world are looking to change that through the use of dark magic and rituals. If successful, the cult might be able to tilt the Atropal planet into a collision curse with the material plane. Such a catastrophic event would certainly be the end to all intelligent life in the material world. Cults today sacrifice innocent people and creatures in the name of the Black Star. The sacrifices and rituals grow bolder and more depraved as time goes on. Each time they succeed, The Atropal gets closer. One day, the main cult will be ready to perform the final ritual, a welcome chant to the Atropal, as the sky rifts and a grand portal opens wide to let in the creature which will burn the world. 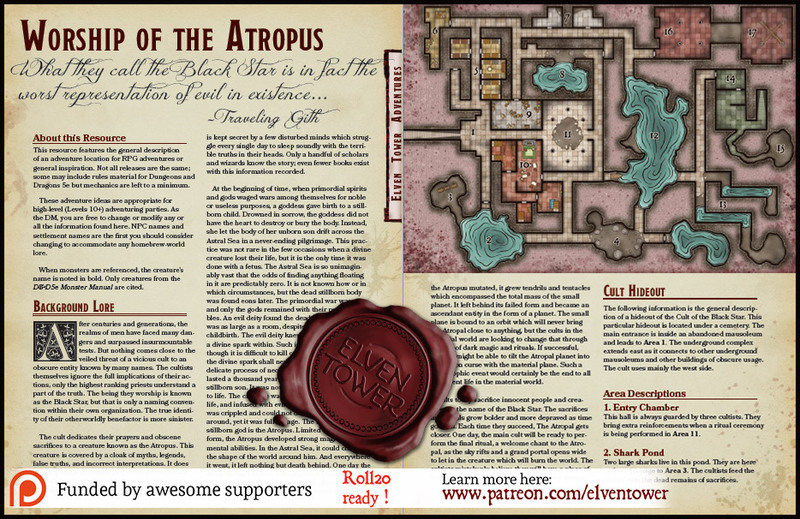 The cultists mistakenly believe they will have a place of honor when the Atropus arrives. They are wrong. The following information is the general description of a hideout of the Cult of the Black Star. This particular hideout is located under a cemetery. The main entrance is inside an abandoned mausoleum and leads to Area 1. The underground complex extends east as it connects to other underground mausoleums and other buildings of obscure usage. The cult uses mainly the west side. This hall is always guarded by three cultists. They bring extra reinforcements when a ritual ceremony is being performed in Area 11. Two large sharks live in this pond. They are here to deter passage to Area 3. The cultists feed the sharks with the dead remains of sacrifices. The two high priests put their most valued heirlooms and cult paraphernalia here. One of the chests is secretly a mimic. The other two chests have fine locks. A cave-in in this section enlarged the hallway. The terrain is loose mud. 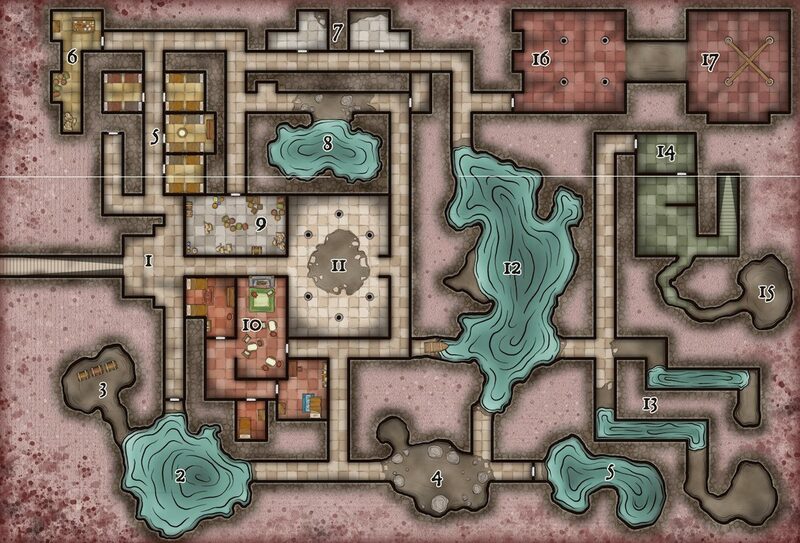 Two carrion crawlers hunt in this area but do not dare venture farther into the dungeon. Not all cultists live in the hideout but there are enough double bunk beds to house up to 32 people in four different chambers. The accommodations are frugal. Low-rank cultists gather in this room to eat. The south side of the room is a storage area of sorts. There is nothing of value except the food itself. The cultists used these rooms a while ago but they were abandoned. nothing of value remains in them. The east room is often haunted by two wraiths. If the adventurers visit this location, there is a 50% chance they will be ambushed by the undead. The hallway caved-in and opened up to an extension of the underground lake. The pond is connected to Area 12 via an underground passage. The creatures from Area 12 can be encountered here too. This spacious room is packed with crates, barrels, sacks, and chests. Most containers have edible food and wine. The cultist priests know a divine spell which purifies food if it goes bad. They use it often in the storage room to ensure there are plenty of supplies at any moment. The four priests enjoy better-fitted accommodations than the rest of the members. They have private rooms and a study room. The furniture and decoration in these chambers are cozy and welcoming. The cult gathers in this location to perform evil rituals. In most cases, the ritual consists of a living sacrifice placed in the center of the chamber. The person or animal is then killed on the spot; the method varying depending on the particular ritual. Releasing the soul of the sacrifice in this way powers the ritual and produces an immediate consequence. Most rituals involve a group of members chanting power words and ancient incantations. If these chants are interrupted, the ritual fails and it must be tried again from the very beginning. In some rituals, the victim is sacrificed at the beginning of the chanting, but in others, the sacrifice occurs at the very end. This lake is the home of a family of crocodiles and swarms of quippers. Both species have been conditioned to be immediately aggressive to anyone who tries to swim through the lake. The cultists use a boat by the south side when they want to access the eastern side of the complex. There is a submerged channel that connects this location to Area 8. Recent cave-ins and floods have rendered these passages useless. It would require weeks of work to drain and dig through them to open up the hallways to hidden areas. The cultists kidnap prisoners for the rituals every so often. The type of person kidnapped depends on the ritual. The priests inform the cultists a few days in advance of the ritual so that they can procure the appropriate person for the sacrifice. Prisoners are brought to this location and left without any weapons or belongings, their wrists tied to chains on the walls. One of the priests finds it amusing to turn people into ghouls. A few of them are stationed here doing nothing. They attack any creature on sight except for the priests. Over time, the priests have decorated this chamber with grandiose decorations that depict ancient wars between unknown deities and terrible entities known as the primordials. Most of this is shown in frescoes and bas-reliefs on the walls and pillars. The priests plan to move to this location for rituals soon. It all depends on the safety of the underground complex. The ceiling of this chamber is magical, it is translucent to the night skies. A person can see an enhanced version of the night sky here. The fact that there are countless feet of packed soil above the room does not seem to matter here. The priests placed a few planks in the center of the chamber to sit while they gaze upon the skies.